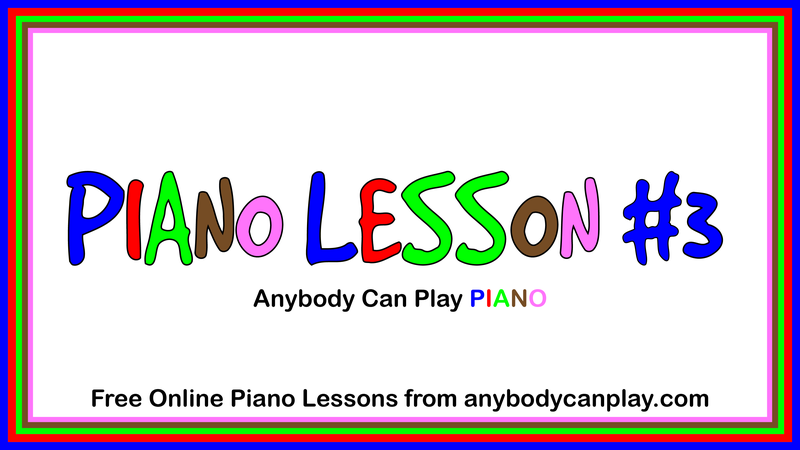 ONLINE VIDEO PIANO LESSONS FOR CHILDREN FROM 3 TO 103! Lessons utilize the Anybody Can Play PIANO app: Cost:$1.99 per month. Computer or tablet needed that uses Windows 10. A touch screen can be used with or without an attached keyboard or controller. An attached MIDI keyboard or controller (as small as 25 keys) is needed with a non-touch screen. To subscribe to the Anybody Can Play PIANO app in Windows 10 click here. All Anybody Can Play Piano videos are on youtube.com. To go directly to the ONLINE PIANO LESSON ONE VIDEO click here. This gives parents or teachers guidelines for using the PIANO LESSON VIDEO. It also gives additional ideas for presentation to children. 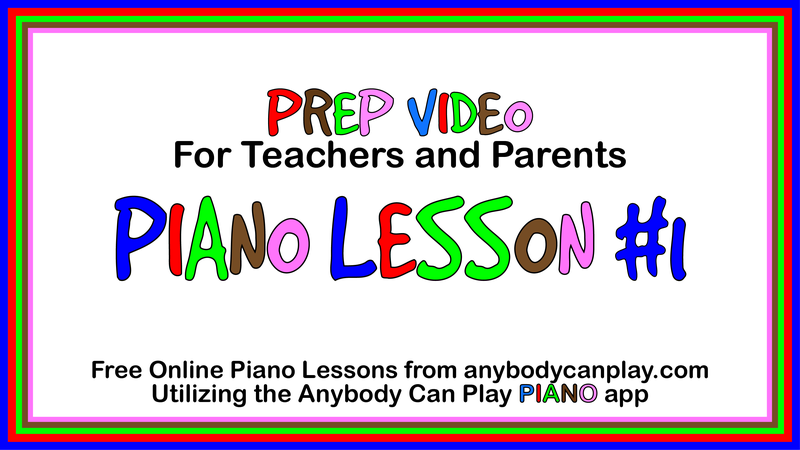 To go directly to the PREP for ONLINE PIANO LESSON ONE VIDEO click here. Activities that are going to be done with many children or done repeatedly with one child should be laminated. This makes them stable and reusable for a long time. Most low cost laminators laminate up to 5mil, which is perfectly adequate for this type of usage. Even looking at the images, you have probably noticed that most of the laminated sheets are laminated in such a way that the laminate surrounds the entire activity sheet or shape. This is added protection since it makes the sheet waterproof and very long lasting. All the activity sheets have a lightly colored dotted cutting line about an inch from the edge. Trim the sheets before laminating so when the sheet is punched for the binder the holes are also completely within the laminate. Shapes like the tiny hands are cut out, then placed within the laminate so there is extra room between them - again so they are surrounded by laminate when cut out. The cover for the student binder. Just click on Cover to print out. 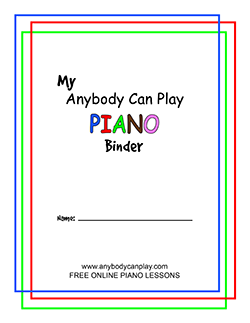 I recommend that every parent or teacher make a special binder for the Piano Lesson materials. Use a zip packet inside for small items such as markers and simply punch other materials so they can be stored inside the binder. Tiny Hands for color coding. To make the color coded samples for the children, choose one of the color coded sets, cut around each (or both together) hand(s), then laminate. Punch through the laminate so the hands can be stored within the binder. Just click on Tiny Hands to print out. Dots for finger color games. Trim and laminate. 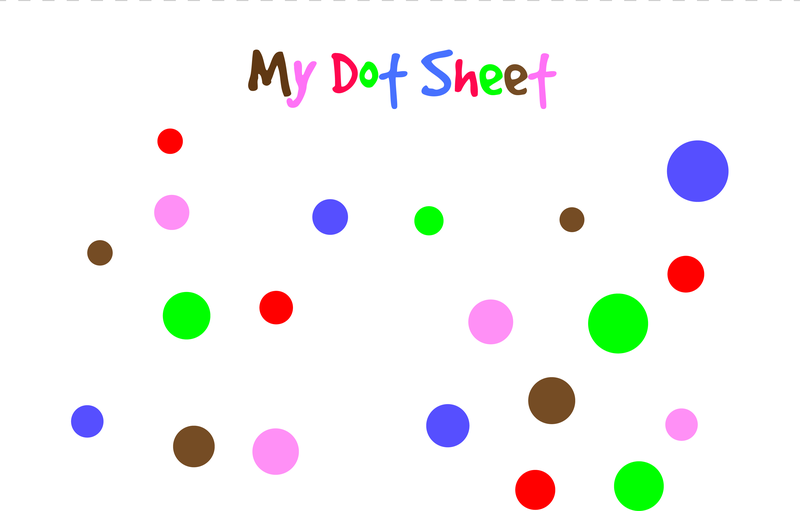 Just click on Dot Sheet to print out. A "Spot" for our removable sticker dots. Cut apart and laminate, leaving a space so a hole can be punched through the laminate for binder storage. Just click on Spot For Dots to print out. 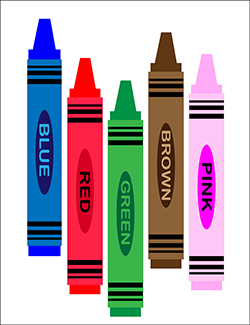 Crayons, markers or removable sticker dots for color coding: Blue, Red, Green, Brown, Pink. 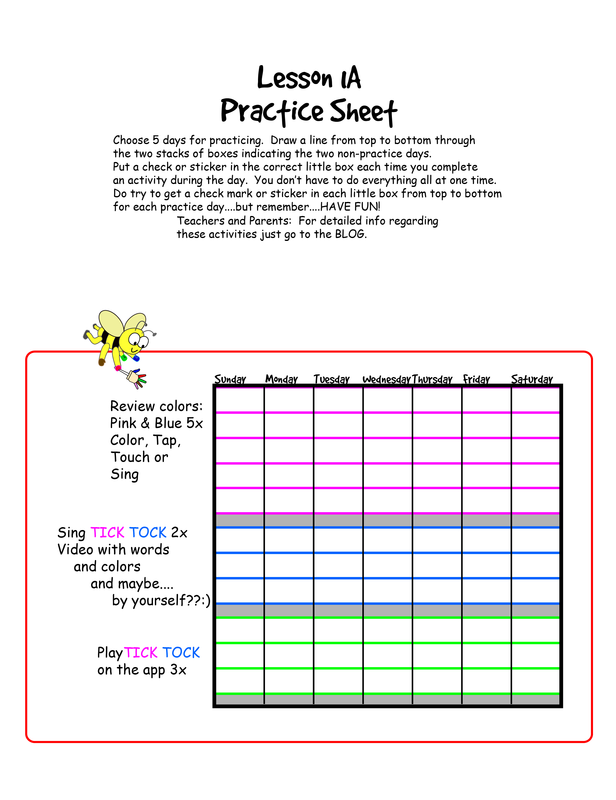 These Practice Sheets help to separate different activities for review and practice on a daily basis. They also function as "Lesson Plans". Do these activities with the lesson video, other videos listed, or in your own way. 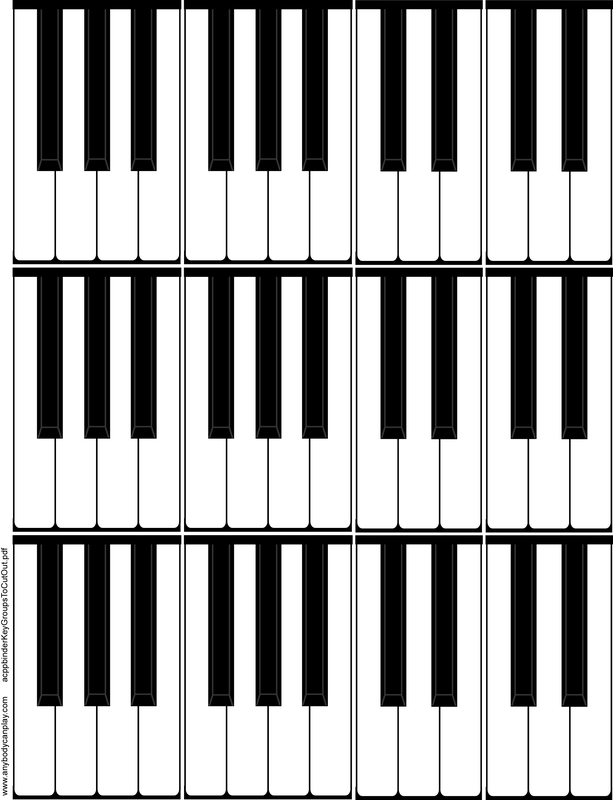 Just click on Practice Sheets to print out. Lesson Two has its own Playlist on youtube.com called: ACP ONLINE PIANO LESSON TWO. 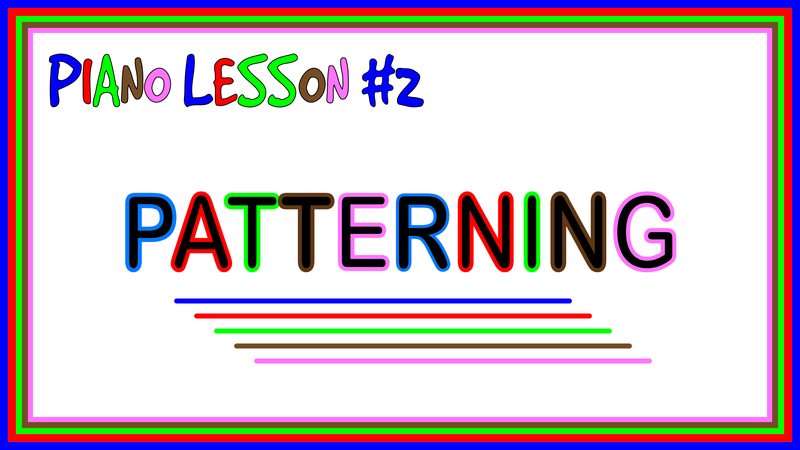 In addition to the actual Lesson 2 video this Playlist also has several other short videos with color coding, patterning games and songs. To go directly to the PIANO LESSON TWO Playlist click here. This song is already on the PIANO LESSON ONE VIDEO, but is separate as well for your convenience. To go directly to Tick Tock click here. Your "official" Anybody Can Play PIANO binder should already have these materials inserted in it. A "Spot" for our removable sticker dots. Cut apart,laminate, leaving a space to punch a "binder" "hole. Tiny Hands for color coding. Cut around each (or both together) hand(s), laminate, punch hole for storing. Just click on Tiny Hands to print out. If these materials are to be used repeatedly, laminate. Tiny Hands for color coding. 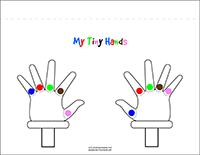 For review, make paper copies of the unmarked fingers page and let children color code the fingers with crayons or markers. Just click on Tiny Hands to print out. 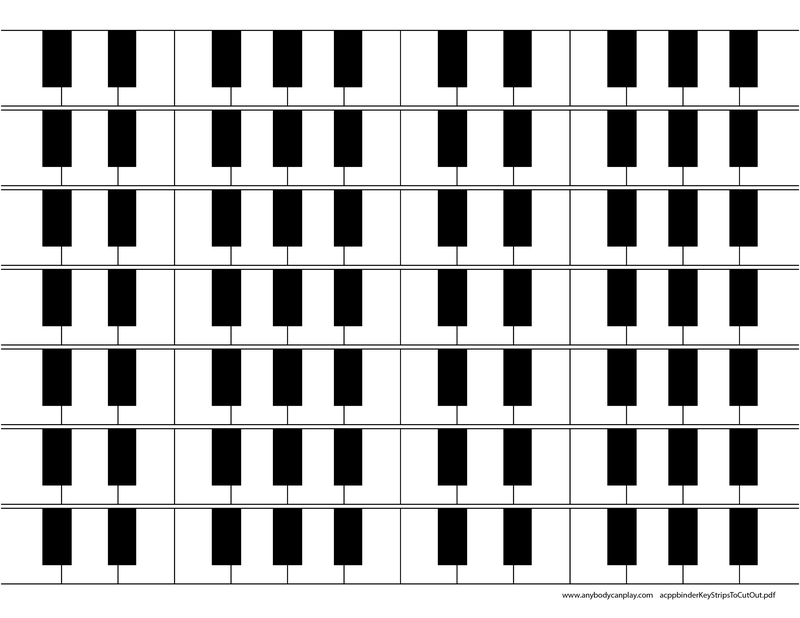 Tiny Key Groups for lining up in order. Laminate sheet, then cut out each group....one complete sheet per set per binder. Just click on Key Groups to print out. 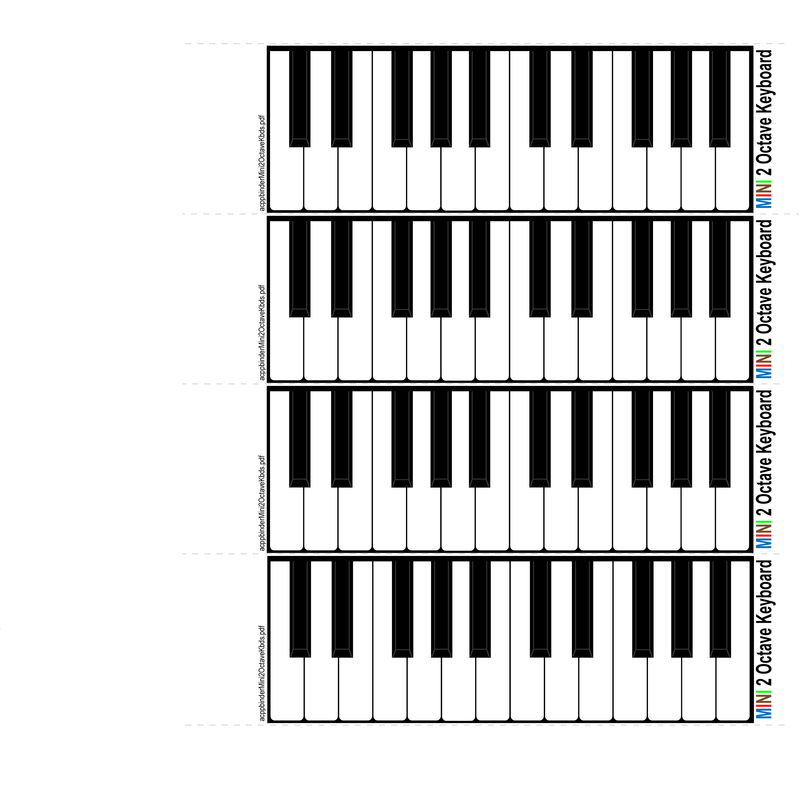 A 2 octave keyboard for patterning games. Trim off the 1 inch edge, laminate and punch for binder. 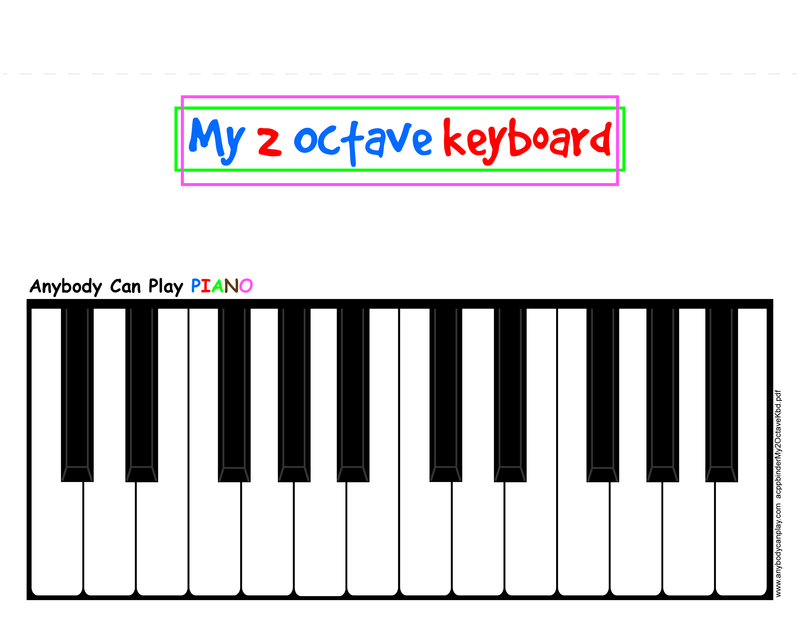 Just click on 2 Octave Keyboard to print out. 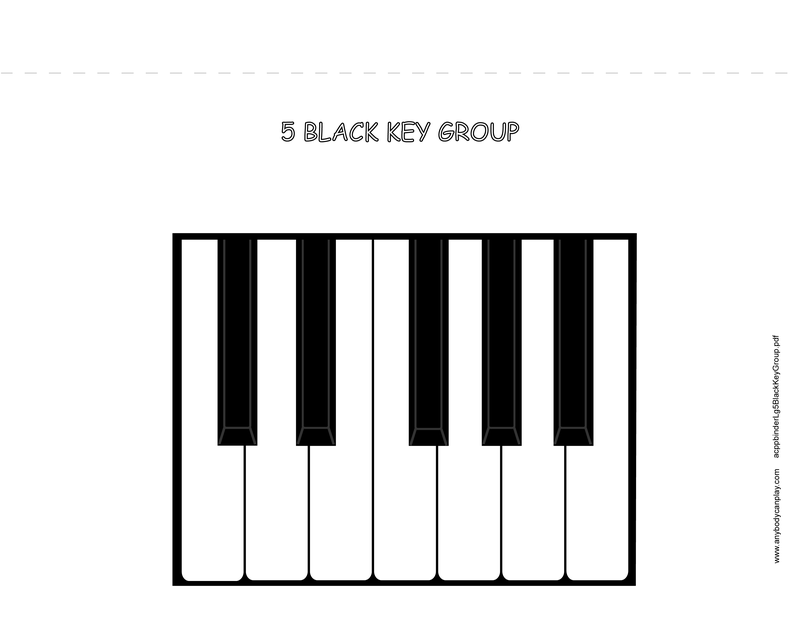 A large 5 black key group. This can be used for many different patterning games. Trim off the 1 inch edge, laminate and punch for binder. Just click on Large 5 Black Key Group to print out. 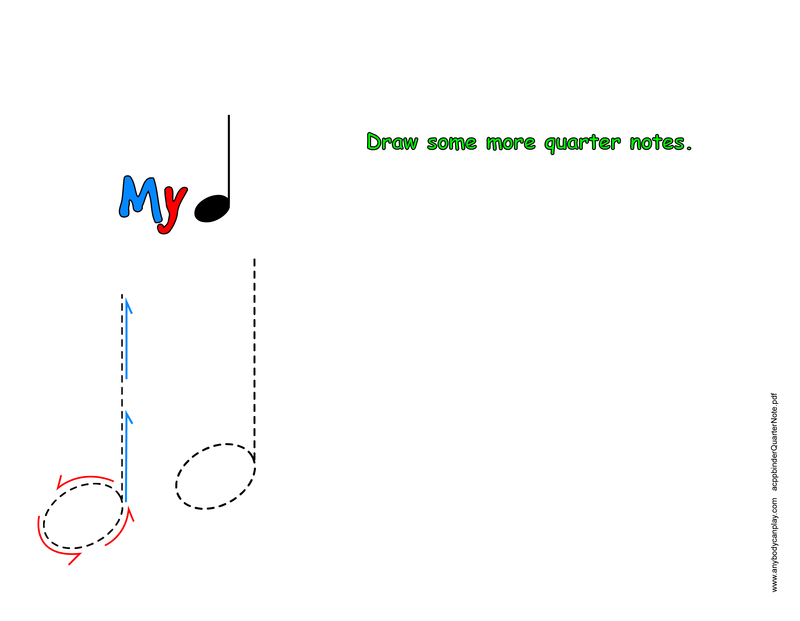 This sheet introduces the quarter note and how to draw it. Make paper copies for drawing purposes. 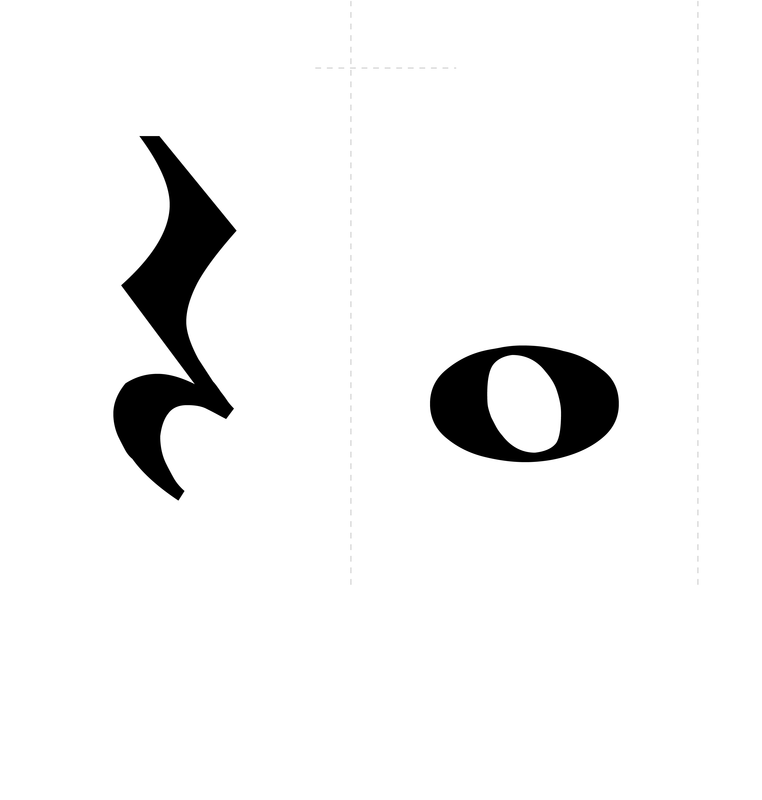 Just click on Quarter Note to print out. 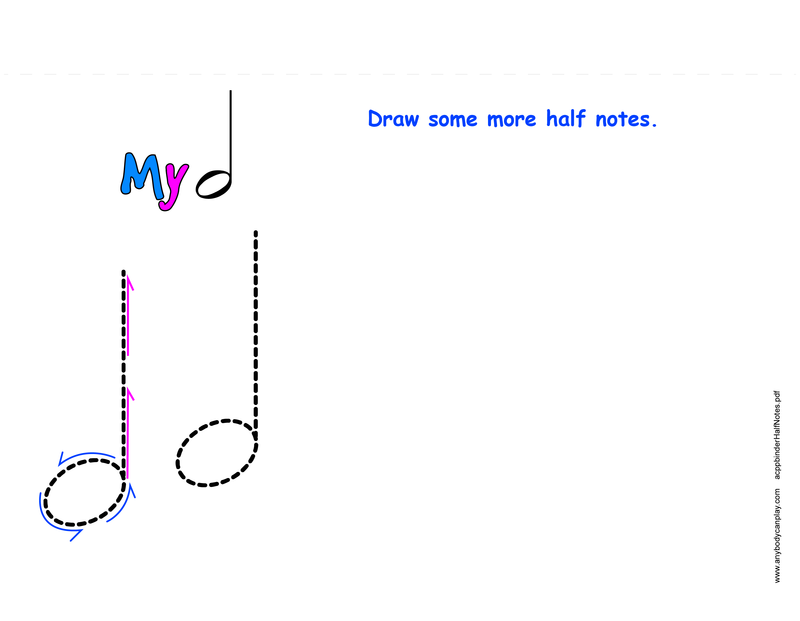 This sheet introduces the half note and how to draw it. Make paper copies for drawing purposes. Just click on Half Note to print out. Lesson Three has its own Playlist on youtube.com called: ACP PIANO LESSON 3. This Playlist also has other short appropriate videos. 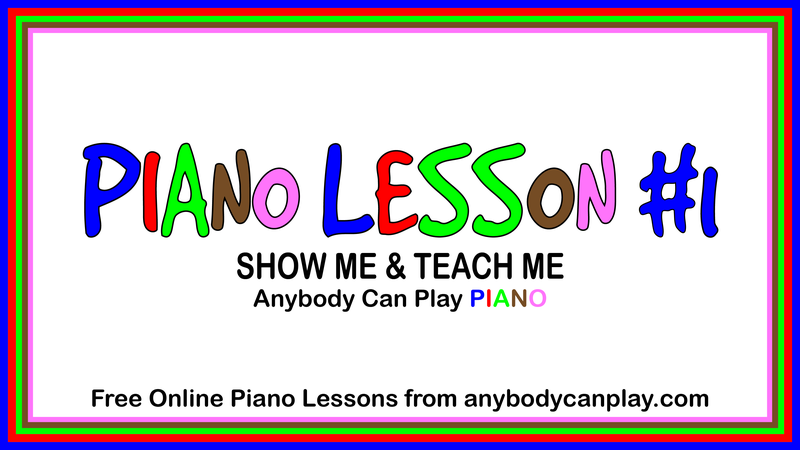 To go directly to Anybody Can Play VIDEO PIANO LESSON 3 click here. I cannot say it enough..... These lessons are not meant to be shown to young children from start to finish. Just show parts at a time. Do encourage each child to use the app to learn to play the songs. 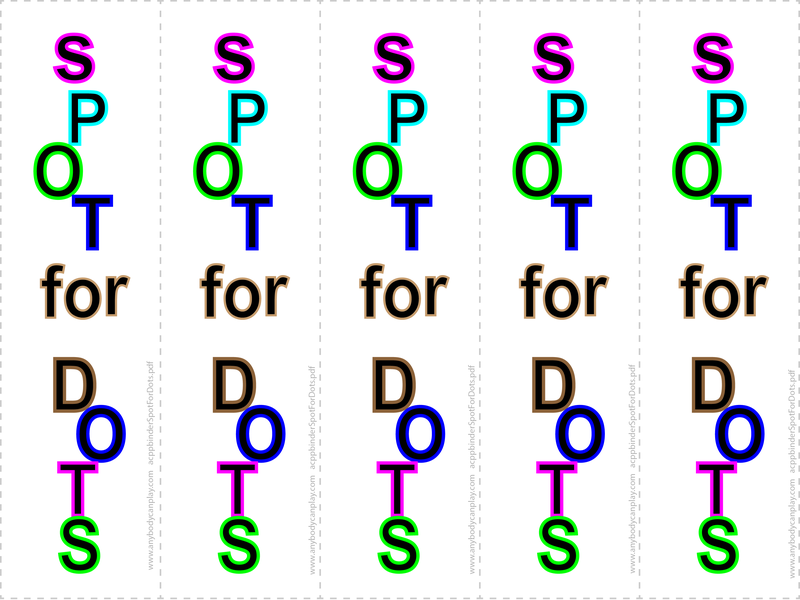 Sometimes dots are used in the videos and other times children are coloring with crayons or markers. Generally speaking, dots are better for the very young children because they are not yet proficient with coloring....and are hesitant about trying to draw as well. 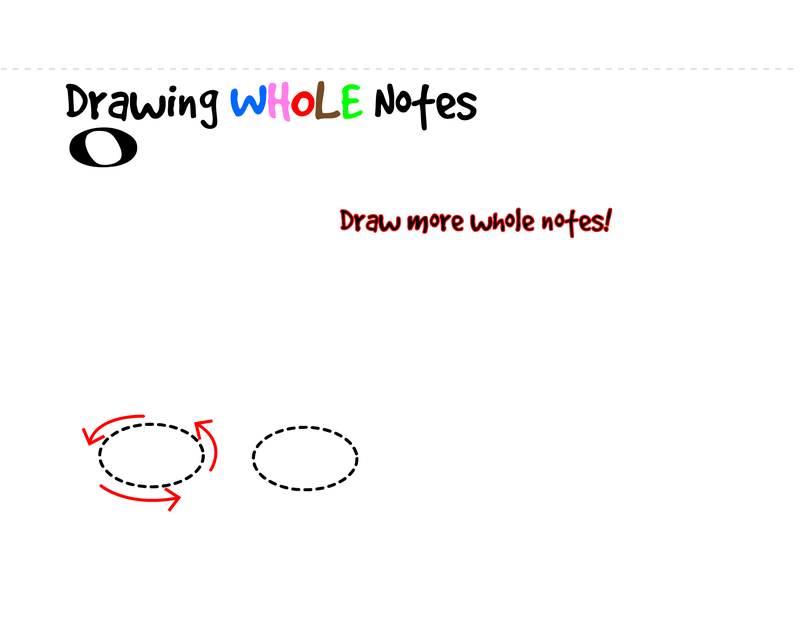 For drawing activities, just let them give directions to someone else for drawing things like quarter notes. In some cases, they will let you hold their hands for guidance in order to make a drawing. Computer or tablet needed that uses Windows 10. A touch screen can be used with or without an attached keyboard or controller. 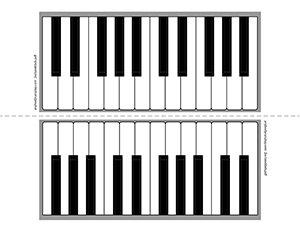 An attached MIDI keyboard or controller (as small as 25 keys) is needed with a non-touch computer screen. To subscribe to the Anybody Can Play PIANO app in Windows 10 click here. To go directly to the Anybody Can Play PIANO Playlists click here. This is tapping game to further implement muscle memory within each finger. It is also the beginning of even beats. 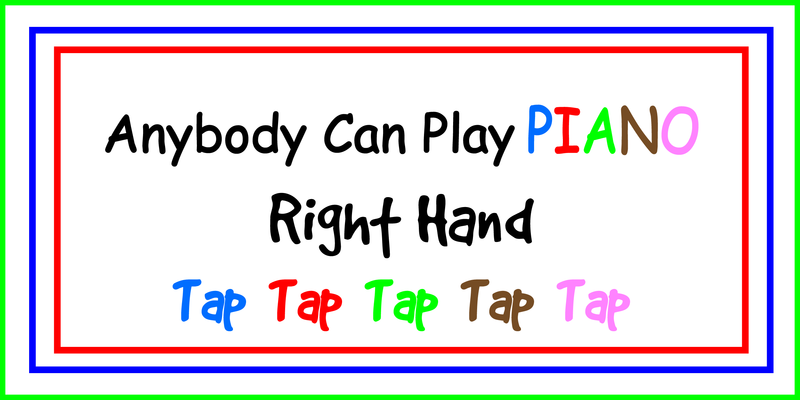 To go directly to Right Hand Tap Tap Game click here. This video is a review of two black key and three black key groups. Again, included for convenient review. To go directly to Key Groups click here. If these materials are to be used repeatedly, laminate. Sheets for coloring should just be regular paper sheets. Keyboards to cut out for color coding patterns from one keyboard to another. Make plain paper sheets for coloring or for repeated use with removable dots cut closely around each keyboard and laminate, leaving a clear laminate edge completely around the keyboard. Just click on 2 Keyboards to print out. Small keyboards to cut out for color coding patterns from one keyboard to another. Make plain paper sheets for coloring or for repeated use with removable dots cut along dotted lines and laminate, leaving a clear laminate edge completely around the keyboard plus the 1 inch clear border on one edge if you wish to insert in the binder. Just click on Mini Keyboards to print out. Flashcards for quarter and half notes. Cut along dotted lines for both front and back creating 2 flashcards each 5 inches wide by 7 1/2 inches high. Cut out descriptions and glue onto back...a few swipes with a glue stick will do! Laminate, leaving clear laminate around all edges with the clear 1 inch top edge border for punching and inserting into the binder or on a ring. Just click on Flashcards to print out. 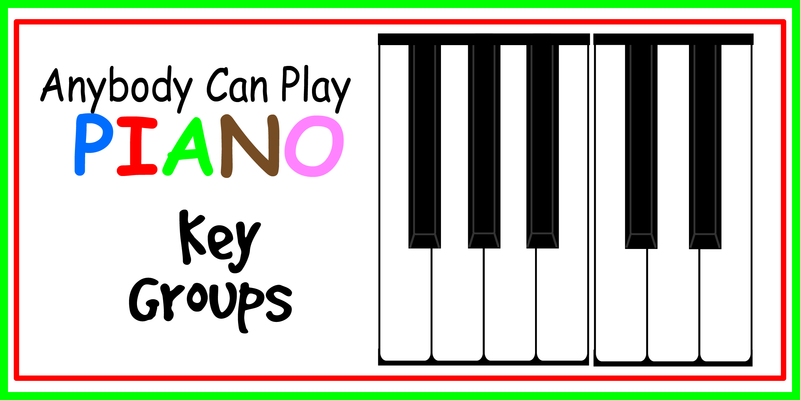 Cut apart and color code to another keyboard or song code on the Anybody Can Play PIANO app. Place behind keys of a small keyboard controller as shown in the video. For repeated use, laminate. Just click on Keystrips to print out. Lesson FOUR has its own Playlist on youtube.com called: LESSON 4: Anybody Can Play PIANO. This Playlist also has other short appropriate videos. To go directly to the LESSON 4 Playlist click here. 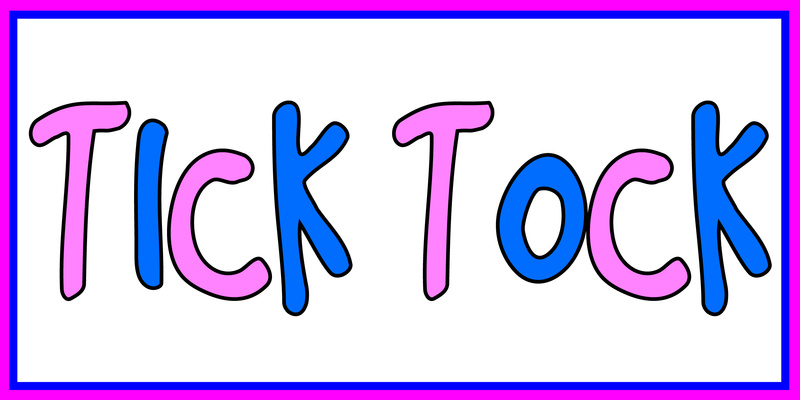 By this time students should be able to play Tick Tock and Rain Rain Go Away with one hand and be at least starting to try to play the melody with both hands at the same time. 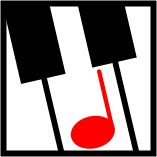 To go directly to the Anybody Can Play PIANO Playlists for the VIDEO PIANO LESSON 4 click here. 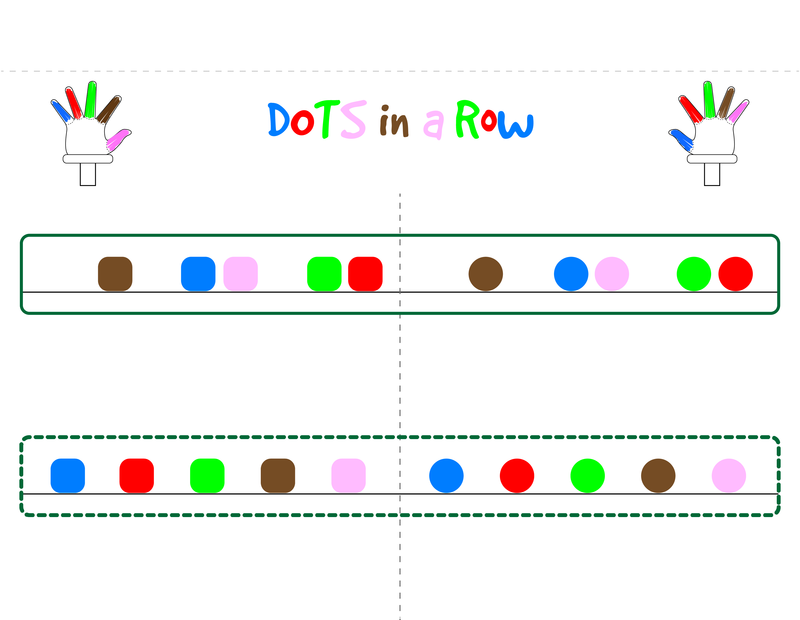 This new Dot Game has dots in a row so hand movement is identical to movement on a piano keyboard when playing a melody with both hands at the same time. This should be laminated for repeated usage. Just click on Dots In A Row to print out. Two more flashcards have been added with this lesson. They should be laminated like the first two for repeated usage and placed in the binder or on a ring. To access the additional flashcards, just click on Flashcards to print out. 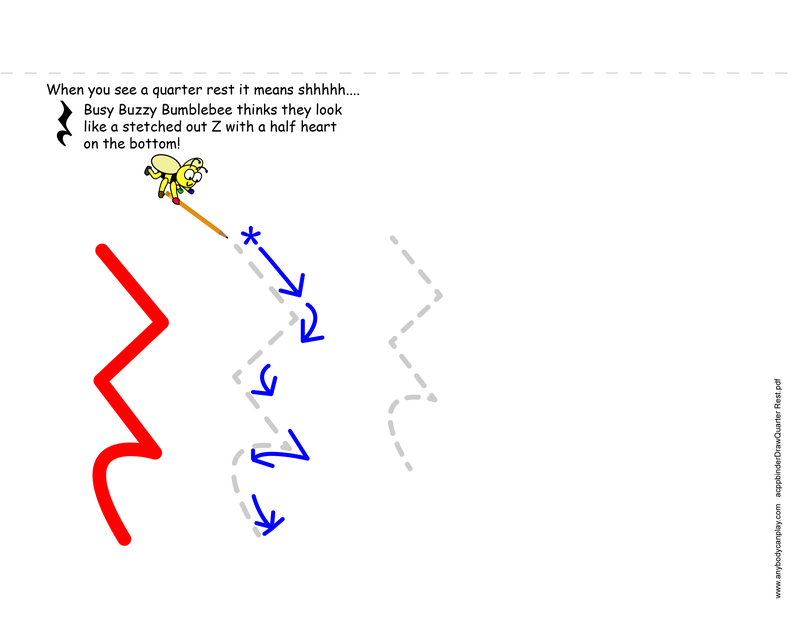 This sheet lets students trace and draw a quarter rest. Very young children may not be able to trace, so just have them "trace" over the rest with their finger or give instructions to someone else how to draw the rest. To access this sheet, just click on Draw Quarter Rest to print out. This sheet lets students trace and draw a whole note. Very young children may not be able to trace, so just have them "trace" over the note with their finger or give instructions to someone else how to draw the note. To access this sheet, just click on Draw Whole Note to print out. These two pages are for rhythm exercises. 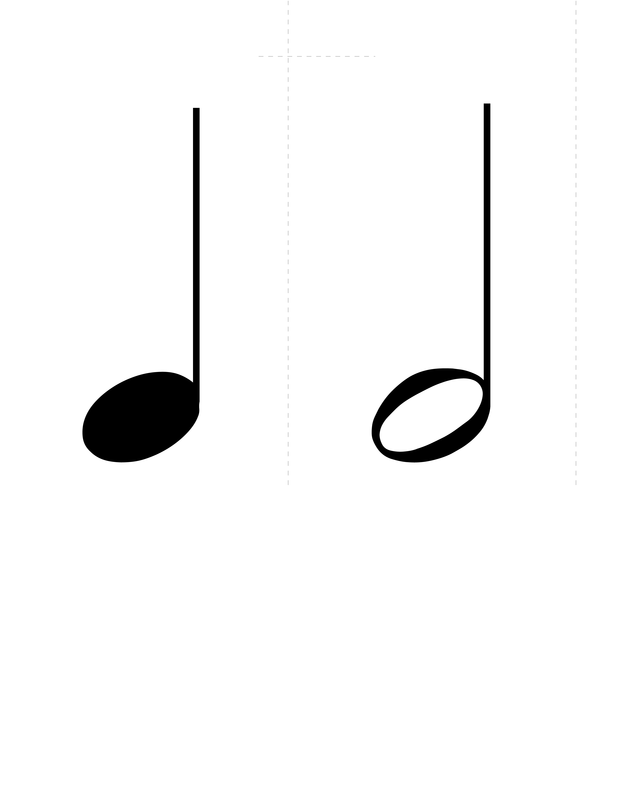 Quarter notes = 1 beat and Half notes = 2 beats. 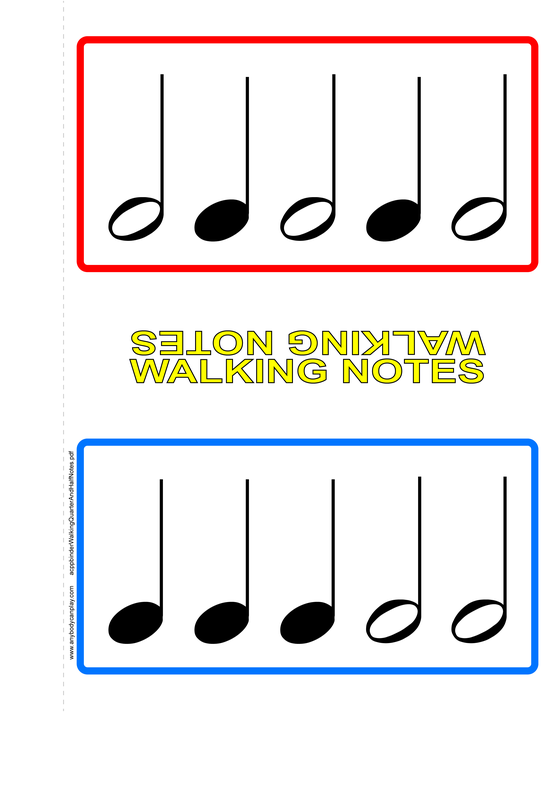 To access this sheet, just click on Walking Notes to print out.